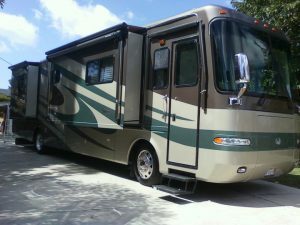 Are You Looking for RV Detailing Services? We’ve always been dedicated to our customers, offering to detail any vehicle they may own, including RVs. Yes, that’s right, we will detail anything with an engine, including RVs and boats. Other automotive detailers don’t like to touch RVs, mainly because of the level of complexity involved when it comes to cleaning and detailing a vehicle of that size. RVs are unique in the sense that they have complex interiors, almost bordering on a small home. Couches, kitchens, bathrooms, sleeping areas; all of it gets a thorough cleaning and detailing. Carpets and fabrics can quickly become discolored or stained simply due to traffic and use, but that doesn’t have to always be the case. We’ve got everything we need, along with the know-how, to make the interior of your RV look like brand-spanking-new, right down to the stitching used in the seats. We’ve got what it takes to make your RV look factory fresh, if not even better. We take pride in our work, and we know that the only way to keep repeat customers is to constantly exceed what they expect from us and provide them with a level of service at a price that’s not only affordable and reasonable, but that won’t be beat by anyone around. We have the knowhow and experience from decades of doing just this to ensure that we do every detailing job right the first time, on time, and under budget. 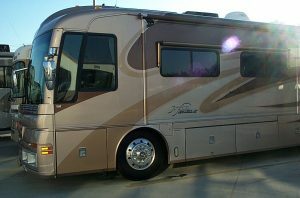 Deluxe Mobile Detailing is the premier RV detailing service Southern California has to offer!